Harvard archeologists and ethnologists probed the jungles of Central America, and the islands of Oceania and Japan in search of art and artifacts. Here are their discoveries. The Peabody Museum of Archeology & Ethnology is a treasure-house of ancient lore, from large carved monuments to everyday tools and implements gathered by adventurers, explorers, archeologists, and scholars in the jungles and mountains of Central America. The Mayan civilization is particularly well represented, with wall-size photographs of jungle scenes, carefully-crafted plaster copies of the giant stelae and zoomorphs from Quirigua, Guatemala, and Copán, Honduras, gold jewelry, and household artifacts. Notes and extracts from diaries posted here and there give you an idea of what it was like being one of the first archeologists to discover and study these fascinating works of art. Located on Oxford Street, a 10-minute walk from Harvard Square (map), the huge and rambling museum building also houses the Harvard Museum of Natural History. One ticket admits you to both museums. From Harvard Square, ask your way to the Science Center and Memorial Hall (map), then walk between these buildings to get to then walk between these buildings to get to Kirkland St. Walk right on Kirkland, and turn at the first left onto Divinity Ave. The Museum (a large, rambling 19th-century red-brick structure) will be on the left, one of the four Harvard Museums of Science & Culture,. 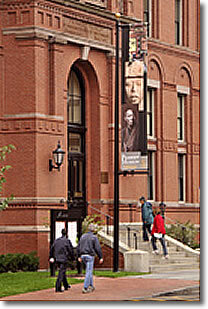 Peabody Museum of Archeology & Ethnology, Cambridge MA.